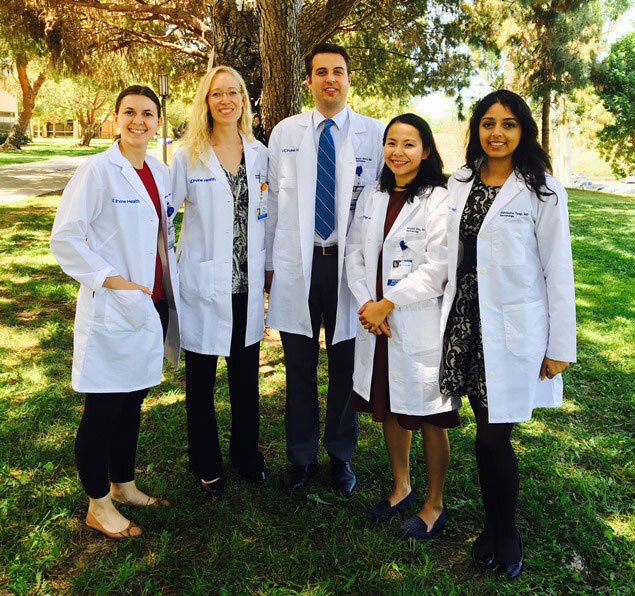 UC Irvine's Department of Dermatology offers a three-year accredited residency program. With a total of 15 residents in the program starting at PGY2, we participate in the match for five PGY2 positions. Before beginning the dermatology residency program, individuals must successfully complete a one-year ACGME-approved residency program in Internal Medicine, Pediatrics, Surgery or Transitional Medicine. Residents rotate at UC Irvine Medical Center, Kaiser clinical centers and the VA Long Beach Healthcare System. 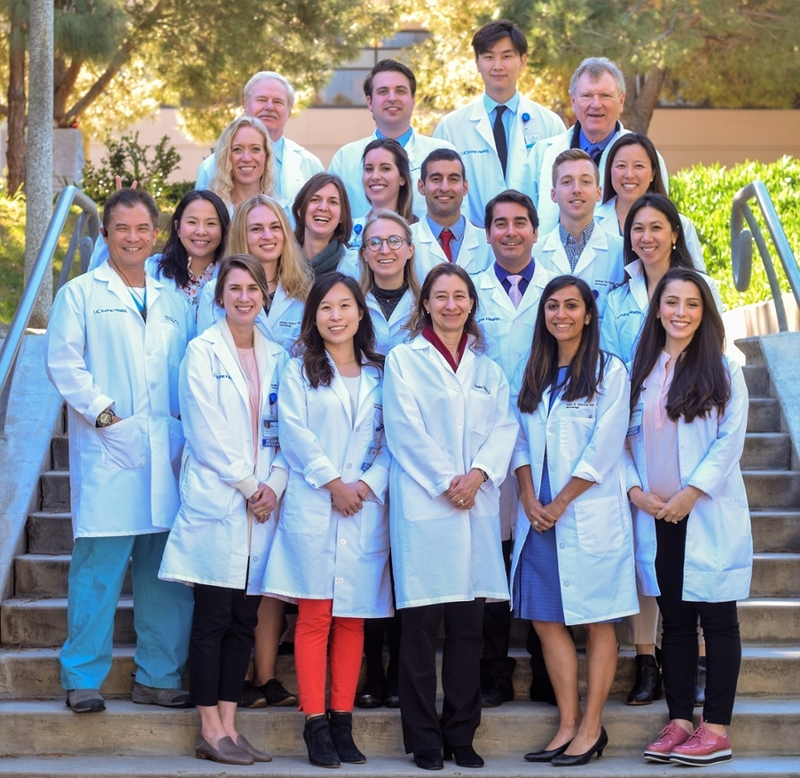 In addition, residents participate in specialty clinical services at Gottschalk Medical Plaza, the Chao Family Comprehensive Cancer Center and the Beckman Laser Institute & Medical Clinic. Residents also rotate with our dermatopathologists in the second and third years and have dedicated research time each week. 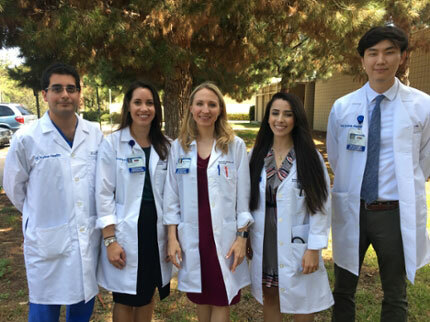 UC Irvine participates in the National Resident Matching Program. We accept applications through the Electronic Residency Application Service (ERAS) developed by the Association of American Medical Colleges to electronically transmit residency applications, personal statements, recommendation letters, deans' letters, transcripts, and other supporting credentials from medical schools to residency program directors. Applications must be submitted by Oct. 31. Please note: Registering with ERAS does not register applicants with the NRMP nor does registering with the NRMP register applicants for ERAS. Applications should be submitted as early as possible in order to accommodate deadlines for supporting documents and interview schedules. Late applications may not be considered. The NRMP provides an impartial venue for matching applicants' preferences for residency positions with program directors' preferences for applicants. In 2009, more than 36,000 allopathic medical school seniors and graduates of osteopathic, Canadian or foreign medical schools applied. They competed for 22,427 residency positions. The NRMP is not an application or job-placement service. Applicants must apply directly to individual residency programs as well as registering for the match. Most programs participate in the Electronic Residency Application Service (ERAS), which transmits residency applications to program directors through the Internet. Applicants must register with both NRMP and ERAS to participate in the services of each. We currently support 15 residents. We also offer a pre-residency clinical research fellowship and a post-residency procedural fellowship. UC Irvine Medical Center is a world-class academic medical center and the only university hospital in Orange County. It is part of the University of California hospital system and is staffed by university faculty physicians who offer the full scope of acute and general care services. The medical center in Orange is the principal clinical facility for the teaching and research programs of the UC Irvine School of Medicine. Dermatology inpatients are cared for at UC Irvine Medical Center and at the VA Long Beach Healthcare System. Our programs are fully integrated at both hospitals. Outpatients are seen at UC Irvine Douglas Hospital and elsewhere at the medical center in Orange, as well as at Kaiser Permanente facilities, the VA in Long Beach, the UC Irvine Student Health Center and clinical locations in Irvine and Orange. The combined program records about 25,000 outpatient visits annually. 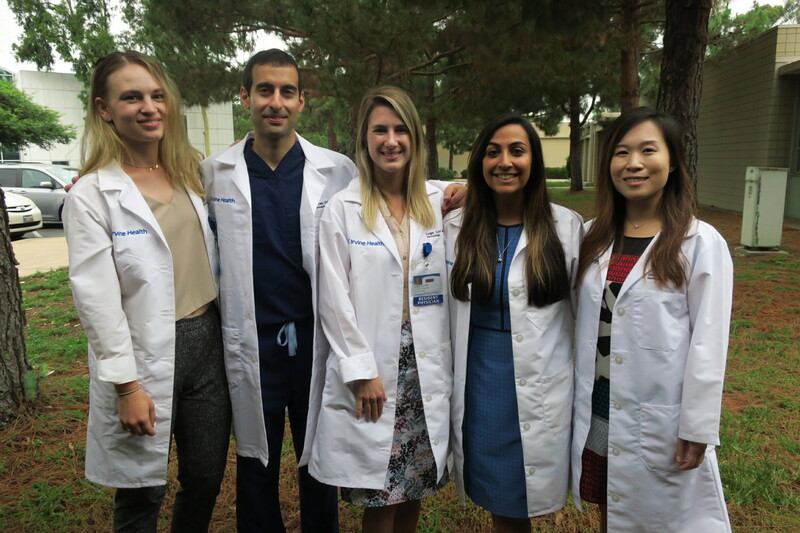 Such varied rotations offer residents a well-rounded experience, permitting the serious student to become proficient in clinical and surgical dermatology, as well as to be involved in areas of dermatologic research. During most rotations, residents have half a day per week to use for basic or clinical research projects or other academic pursuits. Research facilities are equipped with leading-edge laboratories and medical libraries are available at the UC Irvine campus, the medical center in Orange and at the VA in Long Beach. 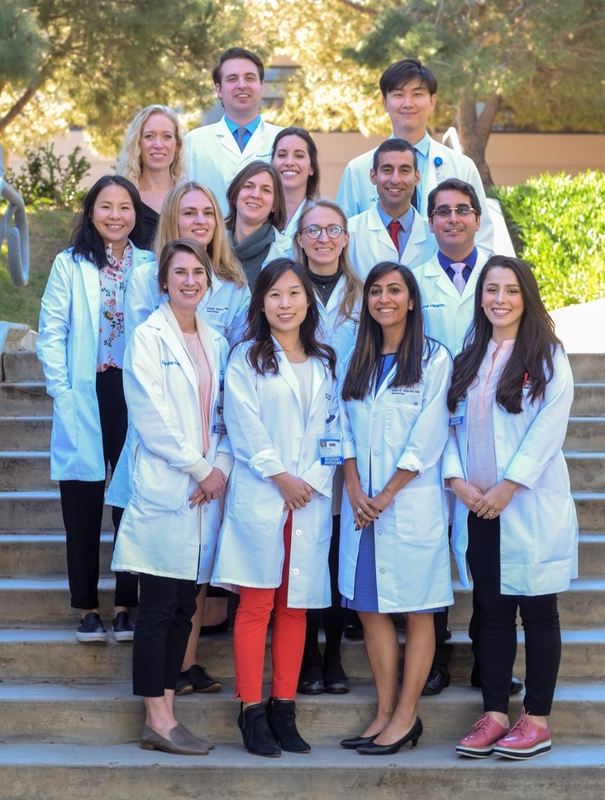 The dermatology residency program includes training in all standard dermatologic treatment modalities, including cutaneous surgery, ultraviolet therapy (UVB and PUVA,) and laser procedures. Dermatopathology is a significant part of our program and all residents rotate through the Dermatopathology Service. A structured basic science and clinical education program is conducted each Friday morning. This instruction encompasses all areas for which residents are examined by the American Board of Dermatology. Didactic lectures are followed by a dermatopathology multi-headed microscope teaching session. Clinical conferences two times per month include grand rounds held at the main university campus at Gottschalk Medical Plaza and the VA in Long Beach (see Grand Rounds/Conferences). The department also hosts monthly Dowling club meetings and quarterly meetings of the Dermatologic Society of Orange County. Second- and third-year residents attend the annual meeting of the American Academy of Dermatology and other meetings pertinent to their research. Resident weekly conferences are held each Friday morning at UC Irvine Medical Center. The conferences include resident presentations, faculty or outside speakers and/or journal clubs.